The Frome boasts splendid trout fishing. The River Frome above Dorchester – Wessex Chalk Streams is proud to offer two beats in this area; one at Frome Vauchurch Nr Maiden Newton and one three miles further downstream. The beats have a good head of wild trout supplemented by stocking, with a trout of well over two pounds a real possibility. The Frome is less affected by abstraction than any other chalk stream and as a result the fishing is good throughout the season, starting with fine hatches of upwinged flies in April and early May. The Mayfly hatches are excellent from mid May until mid June; a particular feature of the river Frome is the quality of the high summer fishing which can be surprisingly good in the evenings in July and August with hatches of Pale Wateries, Blue Winged Olives and Sedges extending well into the Autumn. This long and varied beat offers a fine succession of pools, riffles and glides. A great favourite with our clients. Not available weekends in May. Bookable by one rod or two who know each other. 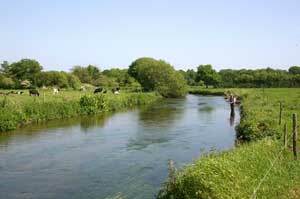 This is one of Dorset’s most famous fisheries and the cream of our fishing on the river Frome. Here the main river and a particularly pretty carrier known as the North Stream, run down each side of a large and peaceful meadow. This has allowed us to offer main river and carrier combination beats. The carrier is similar to the Piddle in size and the main river is comparable in size to the middle Wylye. Moreton is less than 10 minutes by car from Lawrences Farm, and the hamlet forms an excellent base for a days fishing with tea rooms, a pub and even a famous church with unique windows engraved by Laurence Whistler to visit. Booking arrangements at Moreton: Moreton beats 1 or 2 may be booked by one rod, or two rods who know each other and occasionally by a party of three rods. Remember each beat includes the main river and a substantial length of the “North Stream” carrier. WADING IS ESSENTIAL ON ALL OUR BEATS. Non residential day ticket prices are printed in RED and residential day ticket prices in BLUE. Please write, email, use the form on the right column or telephone with your list of requested beats and dates. You will note that all beats are strictly catch and release….